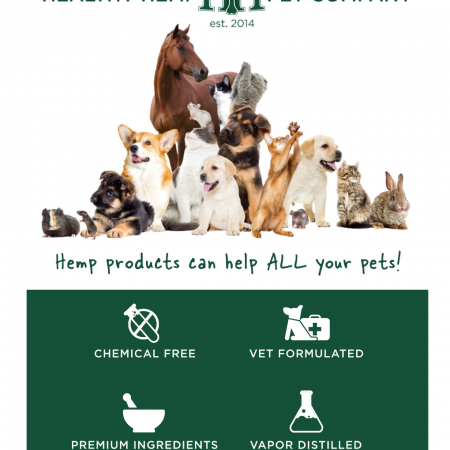 Healthy Hemp CannaDrops™ Salmon offers animal owners and clinicians a more flexible and cost-effective way to administer larger doses of organic full-spectrum terpene rich PCR hemp oil. 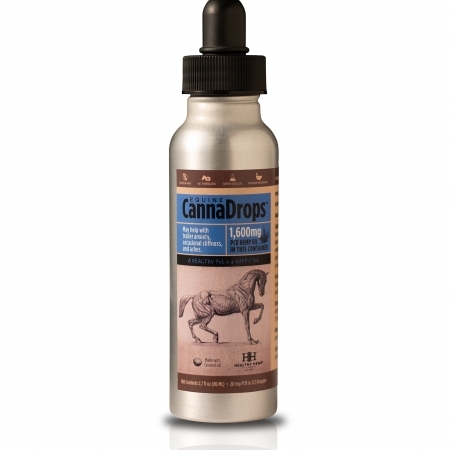 CannaDrops Salmon are small batch made right here in Salt Lake City, Utah. 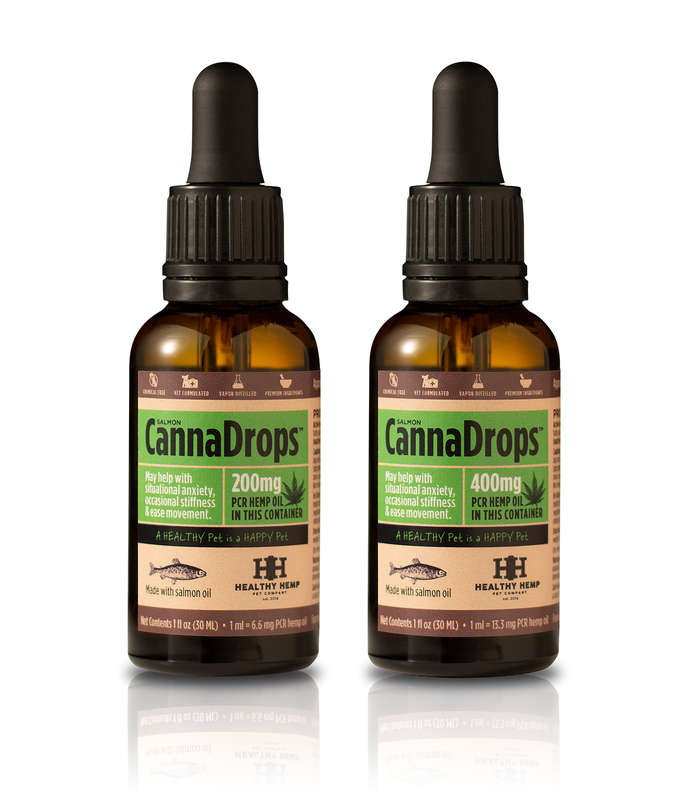 Choose from 200 mg or 400 mg of PCR, phytocannabinoid-rich, hemp oil per 1 oz bottle. Shake well before use. Use 1 mg of organic full-spectrum terpene rich PCR hemp oil per 10 pounds of animal weight. CannaDrops 200: Use 1 mg (6 drops) per 10 pounds of animal weight. 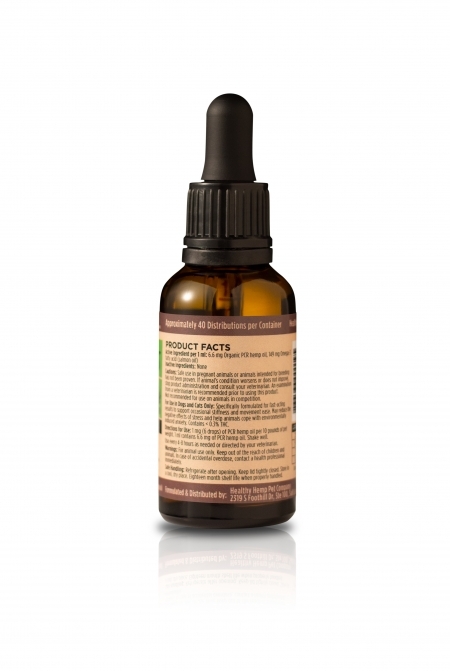 1 ml contains 6.6 mg of PCR hemp oil. Use every 4-8 hours as needed or recommended by a veterinarian. (If treating for situational anxiety administer dose 30 minutes prior.) Shake well. 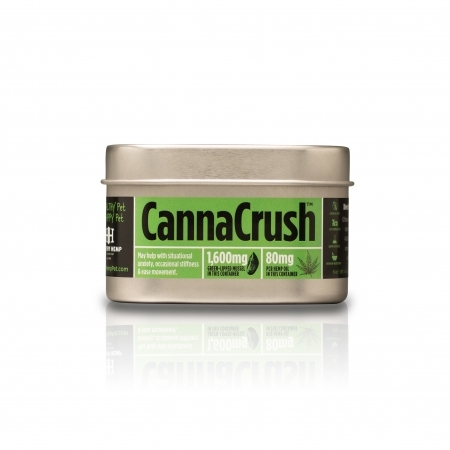 CannaDrops 400: Use 1 mg (3 drops) per 10 pounds of animal weight. 1 ml contains 13.3 mg of PCR hemp oil. Use every 4-8 hours as needed or recommended by a veterinarian. (If treating for situational anxiety administer dose 30 minutes prior.) Shake well. Like all Healthy Hemp Pet Company products, CannaDrops Salmon contain no gluten, no fillers, no chemicals, no fragrance and are cruelty-free. Simply two natural, U.S. sourced ingredients: salmon oil and organic full-spectrum terpene rich PCR hemp oil. No inactive ingredients. The drops have been incredibly helpful in treating my aging pug who suffers from patella lunation pain. Thank you a million time over for helping me treat my guy without harsh pharmaceutics!! Thank you Thank you!!! My Shepherd has ear allergy and infection. She was whining and rubbing her ears all the time. I got your Cannadrops and in 2 days she stopped whinnying and rubbing and is her happy self again!! GREAT PRODUCT!! My baby has a hard time with bad anxiety when they do bomb testing by our home sometimes he got so bad it scared me. Shaking and his breathing .. I tried what the vet gave us but it didn’t work also he has arthritis.in his back i was at loss due to his age not much i could find to help. We tried the 400mg and in a full anxiety it worked in 5 min he was calm. And also is more active.. He thinks at times he’s a pup. I swear my life on these drops it made me cry in joy how much it truly has changed him . thank you!! Canna drops has unbelievable results. It’s a great Product. Sam was diagnosed with bladder cancer almost a year ago. We have been giving him these drops for the past 4 months (along with his piroxicam) and have seen a remarkable improvement. His urine stream has improved greatly and his energy has also improved. Thank you! 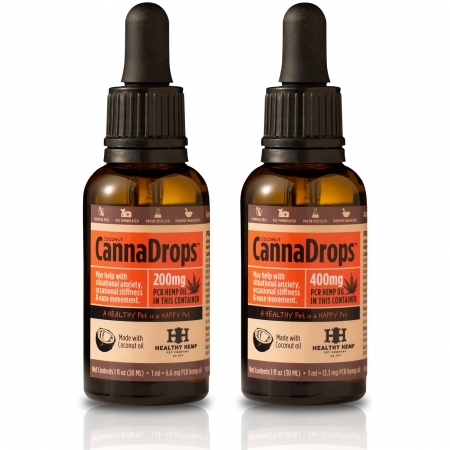 I started giving my 10 year old husky these drops when he was diagnosed with arthritis. He responded much better to these drops over his prescribed Movoflex chews. Gave them to him at breakfast, lunch and dinner. He was able to run and play with the other huskies like he used to. I lost him to a stroke cause by a blood clot June 2018, but also used these drops to ease his anxiety due to frequent vet visits leading up to his stroke. Thank you for helping him be comfortable in his final days.